I rarely eat turkey. It’s usually dry, as in, use-it-for-kindling dry. It’s also pretty flavorless. To get around these shortcomings, I usually brine the meat, and since that is a whole process, I only do it once a year. Too much work for too little payoff, if you ask me. 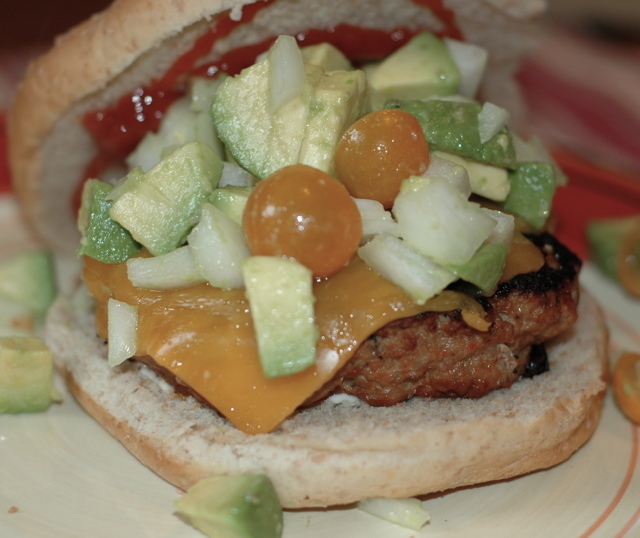 So you can imagine my surprise when I tasted the world’s juiciest and most flavorful turkey burger. I loved it. Sonny loved it. Even Hubby loved it, despite his reservations about turkey burgers. The recipe is from Sara Moulton, and can be found here. It’s very easy to make, but does require a little more time than just forming patties. The only modification I made was that I ran the cooked onions and peppers in a food processor before mixing with the ground turkey (if Sonny were to even suspect the presence of onions or peppers in his food, he wouldn’t touch it). I didn’t do Sara’s salsa either, but threw together avocado, sweet onion and cherry tomatoes instead. In a skillet over medium heat, add about 1 tbs oil. When hot, add the onion and red pepper. Cook until soft and caramelized, which could take 20 minutes. Using a food processor, blend until you get a paste. Put in a large bowl and allow to cool. Once cooled, add the creole seasoning and salt. Blend well. Add the ground turkey and blend well (don’t squeeze the meat). Form into patties. If you plan to cook on a grill, make the patties about ½ inch thick. If you are going to do it indoors, a thicker patty is fine because you can finish them in the oven. I recommend chilling the patties in the fridge for at least 20 minutes (these patties are softer than ground beef patties, so it helps to chill them). I’ve cooked these burgers both on the grill and on the stovetop/oven. Both ways work well, but grilling gives a better flavor. If grilling, resist the urge to turn the patties too often because they will break. If doing them indoors, cook them in a skillet over medium-high heat. For thicker patties, you may need to start them on the stove and finish them in the oven. *I make my own using Emeril’s “formulation”: 2 1⁄2 tbs paprika, 2 tbs salt, 2 tbs garlic powder, 1 tbs each black pepper, onion powder, cayenne pepper, dried oregano, and dried thyme. Keep in an airtight container (like a Ziploc bag) in a dry place.